The Leidse Cantorij at Gloucester Cathedral. Emma’s composition O Lux Beata Trinitas from the poem by St. Ambrose will be sung at Evensong and Eucharist at Gloucester Cathedral, England. O Lux Beata Trinitas plays on the idea of the Trinity. Each vocal line uses only three notes, thus limiting the chord combinations available. A recording can be found on Emma’s composer page. 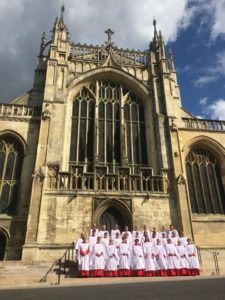 The Leidse Cantorij will be singing in Gloucester from 20th– 26thAugust with conductor Hans Brons and organists Huw Williams and Martyn Noble.